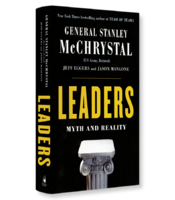 In Leaders, retired U.S. Army General Stanley McChrystal profiles 13 great leaders from a wide range of eras and fields from corporate CEOs to politicians and revolutionaries. Using their stories, McChrystal explores how leadership works in practice and challenges the myths that complicate our thinking about this critical topic. The question of whether successful leaders are born or made has challenged practitioners and researchers for centuries. We have produced endless models for students to follow and studiously documented the careers and key decisions of political, business and military leaders in the hope of distilling the critical ingredients needed to replicate their successes and avoid their failures. In his new book Leaders: Myth and Reality, retired four-star army general Stanley McChrystal presents a new perspective by examining 13 different leaders - six pairs and one standalone - in a fascinating exploration of how leadership in practice often differs dramatically from the theoretical models we are asked to learn in college. Leaders is McChrystal’s third book on leadership. His first, My Share of the Task: A Memoir, explored the major episodes of his career and outlined leadership lessons from his mentors, both good and bad. His second, Team of Teams: New Rules of Engagement for a Complex World, documented his transformation of the Joint Special Operations Task Force into a “flatter, flatter and more flexible” decentralized organization that was capable of defeating Al Qaeda in Iraq. This book follows the template of Plutarch’s Lives of the Noble Grecians and Romans, after McChrystal was inspired by a presentation given at Yale University by journalist David Brooks titled “Who Would Plutarch Write About Today?” The author’s choice of leaders spans a wide range of eras and fields, “from corporate CEOs to politicians and revolutionaries.” The juxtaposition of the six paired sets is not always immediately apparent, but each pair followed unconventional paths to success. McChrystal acknowledges the challenge of defining the topic by citing leadership expert Joseph Rost’s assertion that he found 221 definitions of leadership in 587 examined publications. In the face of such confusion, the author argues, it’s no wonder we have chosen to focus on leadership as a “process influencing a group toward some defined outcome.” This, in turn, places emphasis on the leader alone, rather than embracing all of the other variables at work in each highly individualized situation. Pairing leaders such as Walt Disney and Coco Chanel under the classification of “Founders,” and Boss Tweed and Margaret Thatcher under the classification of “Power Brokers,” clearly demonstrates the author’s dissatisfaction with this traditional approach to the mythology of leadership. Equally, the pairing of Albert Einstein and Leonard Bernstein as “geniuses” leads the reader to think beyond what McChrystal terms the “Great Man” approach to leadership, and consider those other variables. McChrystal was drawn to the template of Plutarch’s Lives for a specific reason. While Plutarch summarized his profiles with a version of his top 10 list of qualities that the reader should emulate, he deliberately avoided presenting a “capstone for how to be an effective leader.” This decision resonated with McChrystal, whose four decades of study of leadership left him with a sense of frustration as to how the topic should be studied and documented. For him, the focus on the individual’s character as a leader is asking the wrong question. Character is certainly critical to successful leadership, but as a primary focus of study it overlooks the contextual questions, “Why did he or she emerge as a leader?” or “What was it about that specific set of circumstances that made his or her style of leadership so effective?” For this reason, McChrystal’s decision to present such a diverse group of leaders in such a “warts-and-all” fashion results in a far more insightful look at successful leadership. The profiles in Leaders of 13 different leaders – six pairs and one standalone – provides a comprehensive analysis of the complexities of leadership. General McChrystal wisely avoids the presentation of an archetype, preferring instead to allow the fascinating stories of each leader and their relative success or failure to serve as a powerful lesson that true leaders never stop looking for opportunities to learn and improve.